There’s a reason poke cakes are so popular. 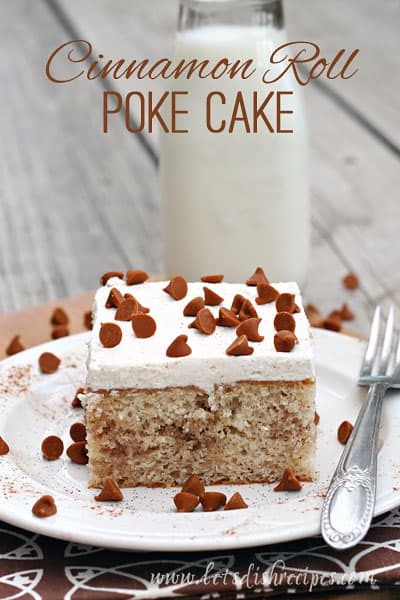 Every one I’ve ever tried has been a delicious indulgence, and this Cinnamon Roll Poke Cake is no exception. The cake starts with a simple white cake (from a box mix, to make things simple) that’s soaked in a mixture of sweetened condensed milk, butter, brown sugar and cinnamon. A light whipped cream topping is the perfect finishing touch. With all the flavors of a classic cinnamon roll, it was pretty easy to talk myself into having this for breakfast. In a medium bowl, combine cake mix, milk, oil, eggs, and 1/2 teaspoon cinnamon and beat until smooth. Pour batter into prepared pan and bake for 20-25 minutes, or until light golden brown. Cool for 10 minutes on a wire rack. Meanwhile, melt butter in a bowl in the microwave, or in a medium saucepan on the stovetop. Add brown sugar to melted butter and stir until sugar is dissolved. Add the sweetened condensed milk and 2 teaspoons cinnamon to the butter mixture and mix until combined. Poke holes in the warm cake with the end of a wooden spoon. Pour the butter/brown sugar mixture over cake. Refrigerate cake for 2-3 hours while it cools. To make icing: in a large bowl, combine whipping cream, sugar, vanilla and cinnamon and beat with an electric mixer on high speed until soft peaks form. Spread whipped cream over cooled cake and sprinkle with cinnamon chips, if desired. Store unused cake in the refrigerator. Wow, I’d love a taste of this right now, Danelle! Your pictures are so lovely. 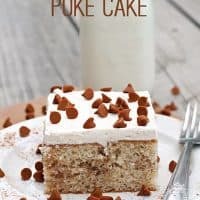 I love poke cakes, and this one looks very good and tasty! Thanks Danelle!